Do I need two steampunk tarot sets? The answer is yes, definitely. Especially when they are both absolutely lovely and both completely different. 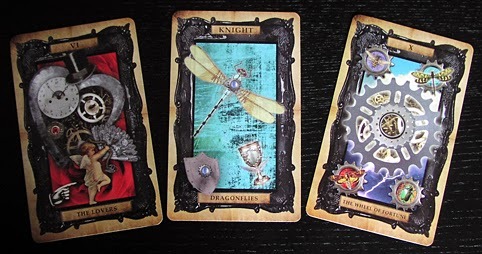 The one you can see photos on this page is the new Victorian Steampunk Tarot. While my other steampunk tarot set - Gods of the Machine - is very science fiction, with gleaming airships and giant robots, the Victorian Steampunk Tarot is more fantastical and dreamlike. The artwork combines clockwork and mechanical devices with Victorian imagery in settings that include iconic English landmarks and symbols. The Empress, for example, shows Queen Victoria on a Penny Black stamp against a golden field with an elm tree in the skyline, behind The Emperor you can make out the Crystal Palace while Judgment shows monuments from London's Magnificent Seven cemeteries. 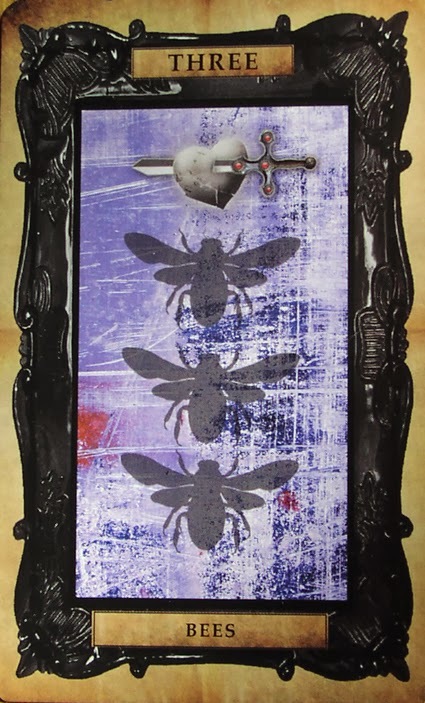 The minor arcana suits are dragonflies, moths, bees and butterflies - reflecting the Victorian obsession with collecting specimens from the natural world, but still associated with the usual tarot elements of water, fire, air and earth respectively. In the book that comes with the boxed set, creator Liz Dean says that for the major arcana her "inspiration comes from the spiritualist movement that began in the UK and USA in the 1840s, at the beginning of Victoria's reign along with the Rider Waite and Visconti-Sforza tarot symbolism." One of the suggested two-card layouts is inspired by a method spiritualists used to get messages from the spirits. The Victorian Steampunk Tarot is certainly likely to appeal to steampunk aficionados. I really wish I had owned a copy a while back when I was asked to play a fortune teller in a steampunk murder mystery game called Intrigue in the Clouds, set on an airship. It would have been the perfect accessory to go with my costume. Even the box that the set comes in looks just right. A more important question was, how well does it work as a tarot deck for divination? The only way find out was to do a reading for myself. I asked a question about romance - you can see the cards I got in a three-card spread at the bottom of this page. In the past: The Lovers. The meaning of that is obvious. 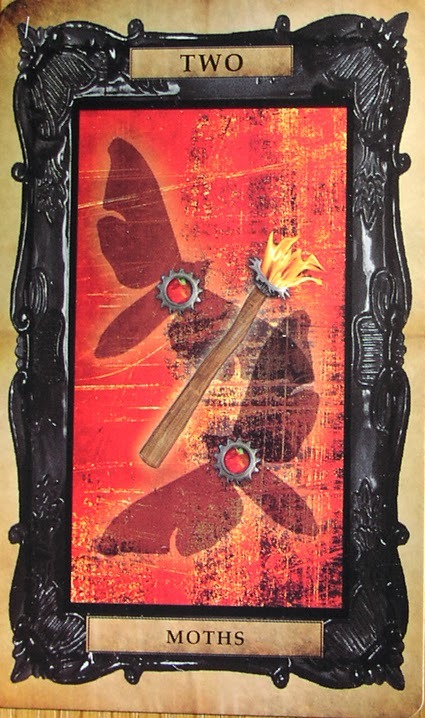 In the present: The Knight of Dragonflies, indicating a good suitor who brings friendship and affection, but more a romantic dreamer than a man of action. Yes, that describes my hubby pretty well. For the future: The Wheel of Fortune.Good luck and a change of fortune is on the way. Well, I hope that prediction comes true and, yes, I'd say any deck that comes up with a reading as appropriate as that is a deck that works. Victorian Steampunk Tarot is produced by Cico Books, which very kindly sent me a review copy. It is due to reach the shops within the next couple of weeks and can be ordered through Amazon. Creator Liz Dean's previous tarot decks and books include The Golden Tarot and The Art of Tarot tarot cards and booklet. Both are also published by Cico Books. I recently bought this deck. I also have another Steampunk deck that I dearly love; but this one excites me in its simplicity. It seems more cerebral, more intuitive. I like the dismissal of some of the ultra-heavy symbolism I've seen in decks over the last 45 years of reading.